Grave/Memorial Reference: IX. B. 7. His brother George is not listed on the CWGC database even though he died of his war wounds. 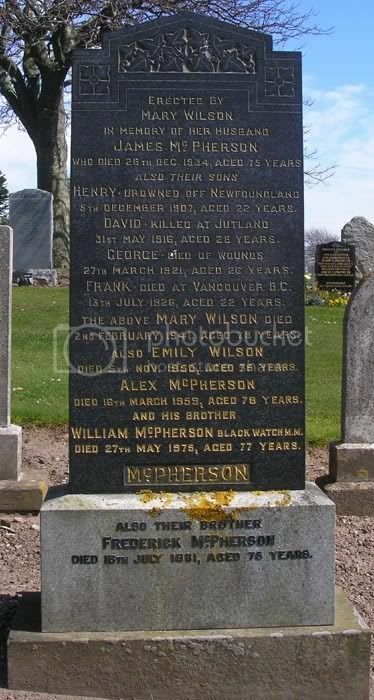 Notice the third son William who was in the Black Watch. 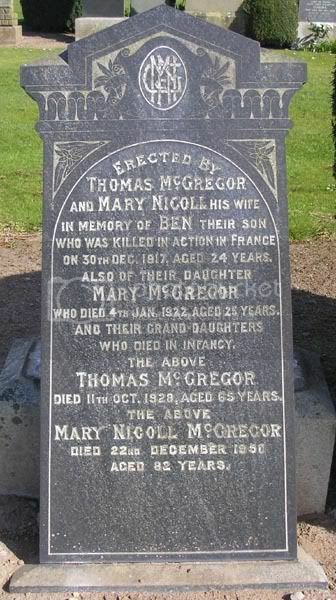 Additional information: Son of James and Mary M. Meekison, of Invermay, Forgandenny, Perthshire. Native of Arbroath. Grave/Memorial Reference: I. P. 19. Additional information: Born at Corran Ferry. 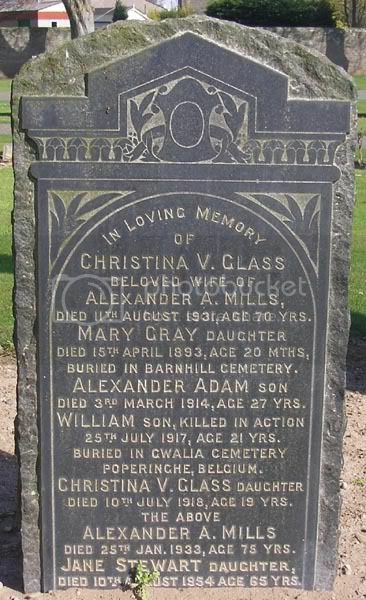 Additional information: Son of Alexander A. and Christina Glass Mills, of 16, Kyd St., Arbroath, Scotland. Grave/Memorial Reference: I. D. 30. 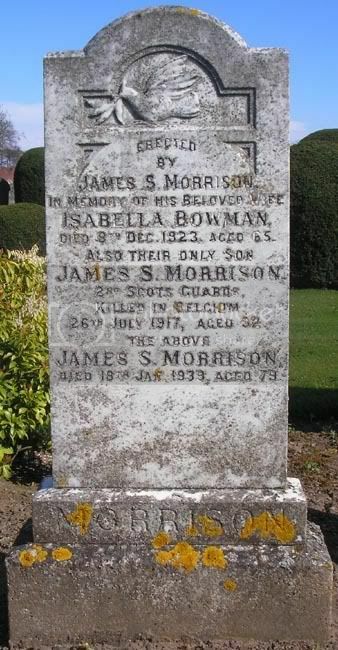 Additional information: Son of James and Margaret Morrison. Grave/Memorial Reference: LXVII. M. 10. Unit Text: 105th Field Coy. Additional information: Son of Mr. and Mrs. David Muckart, of Tarryburn House, St. Vigeans, Arbroath, Forfarshire. Unit Text: "B" Bty. 59th Bde. Additional information: Son of Charles Weir, of 43, Panmure St., Arbroath. Grave/Memorial Reference: IV. Q. 10. Only recently commemorated by the CWGC and headstone erected. Additional information: Son of George and Mary Ann Paterson of Arbroath. N.B. 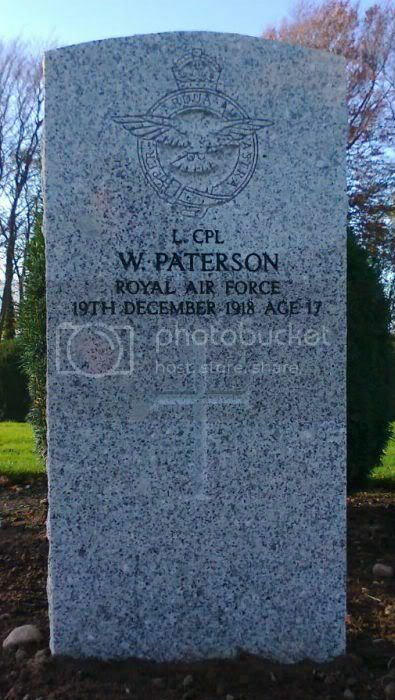 : Recent research has shown that Lance Corporal Paterson is buried here. 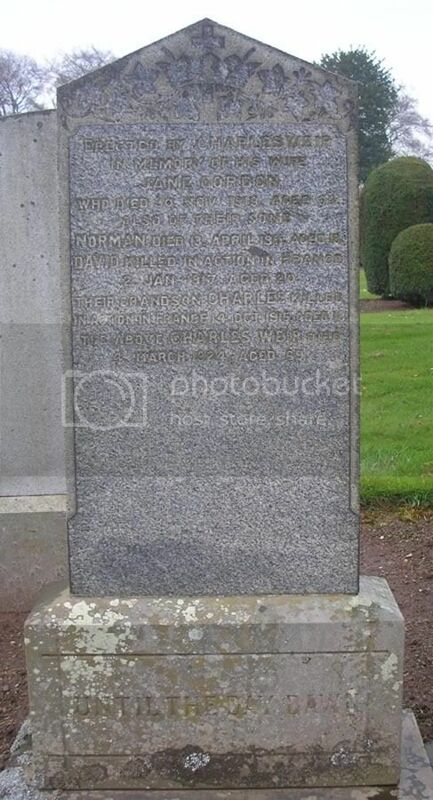 The Scottish National War Memorial , the Castle Edinburgh has confirmed by email yesterday (11th October 2012 ) that they have accepted the death of PRIVATE 240400 CHARLES MCLEOD HENDRY , (18 years ) 5th Bn The Black Watch as a Casualty of the Great War . 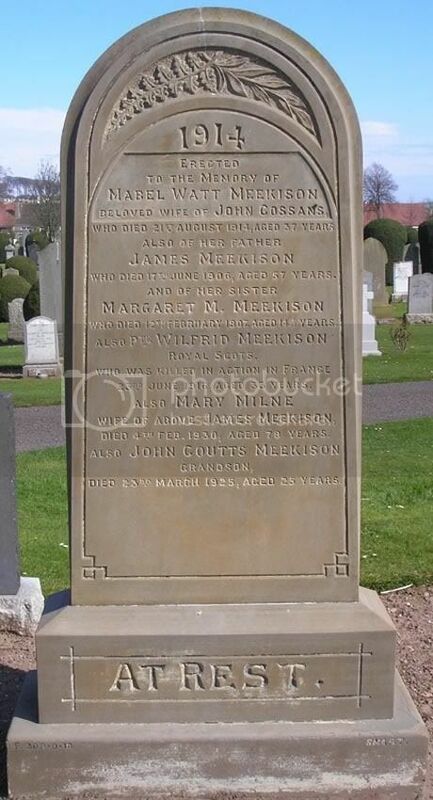 Death was on 16th February 1918 in Arbroath Infirmary . Thanks to Derek Robertson (arbroath ) for his assistance in this enquiry and to David McKenzie (his nephew in arbroath ) and also to Lt Col Roger J. Binks , Scottish National War Memorial , the castle Edinburgh for the assistance give to have this young soldier's name added the Scottish National War Memorial - Black Watch roll . 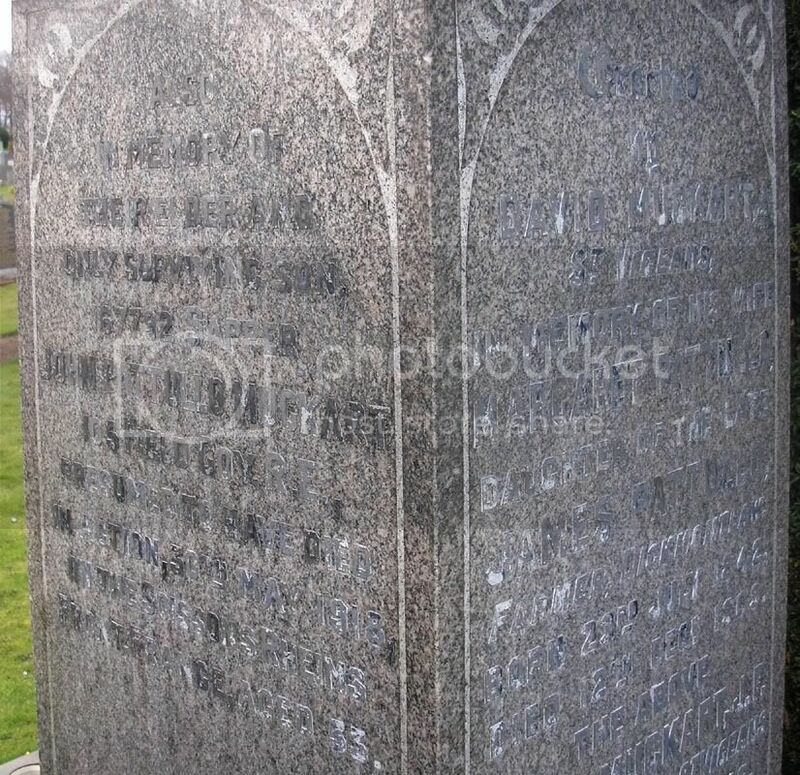 James Law choked to death in Hawick whilst his battalion were stationed there.